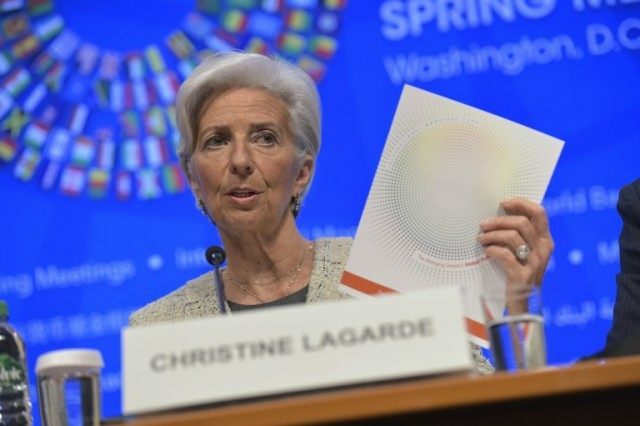 Washington (AFP) – The IMF and World Bank focused Thursday on Britain’s possible EU pullout and widespread tax evasion as key threats to the global economy as they opened their Spring Meetings. Laying out a broad spectrum of risks, from refugee crises and rising protectionism to climate change, the leaders of the two powerful global development banks called for the most developed countries especially to take “immediate” action to stimulate growth to avoid backsliding into a worldwide stall. International Monetary Fund Managing Director Christine Lagarde refused to call the downturn a “crisis,” but stressed the urgency of a response all the same. Both noted the rise in the need to support weak economies, many battered by the crash in the prices of oil and other commodities. “The demand for our services has never been higher outside of a crisis period,” Kim said, saying the Bank expects middle income countries will need some $25 billion in loans this year, $10 billion more than the bank had previously anticipated. The IMF has also seen a rise in demand for its emergency government financing. Last week Angola, its finances battered by the plunge in oil prices, requested a three-year bailout program from the Fund. The Fund lowered its growth forecast for 2016 to 3.2 percent, compared to the 3.8 percent it expected a year ago. “Lower growth means less room for error,” IMF chief economist Maurice Obstfeld said. The IMF said the risks include public debt in advanced economies that are at the highest levels since the end of World War II and unsustainably high corporate debt in emerging economies. It estimated that in China alone, banks hold $1.3 trillion in “at risk” loans from public companies. If not countered with more pro-growth measures, the combination of low growth, low inflation and high debt could combine to push the world economy toward the edge of recession, the IMF warned. One key danger, Lagarde said Thursday, is the possibility of Brexit, a British exit from the European Union. “It’s been a long marriage between members of the European Union,” she said. Kim said an expansion of the conflicts and refugee crises in the Middle East and North Africa are a particular worry. Both Kim and Lagarde were pressing the powerful finance ministers and central bankers from around the world to take firm action to spur economic growth and create jobs, with more government spending, and growth oriented reforms. Meanwhile, the group was expected to take aim at the problem of tax evasion, in the wake of the Panama Papers leak, which exposed the widespread use of anonymous companies in tax havens by powerful people around the world. “When taxes are evaded, when state assets are taken and put into these havens, all of these things can have a tremendous negative effect on our mission to end poverty and boost prosperity,” said Kim.